Hope you've had a good week, and that you enjoy your weekend. I'm going to make some cards using some of the techniques I've learned from Jennifer McGuire's AWESOME Inspiration Showcase. What an amazing class. I love aqua too and you've used it beautifully here, Lucy! this is great ! love the colors and the background ! I love how you combined so many of the things you love to make this card...that I love! It's sweet and so fabulous. Very pretty. Aqua is a lovely color. 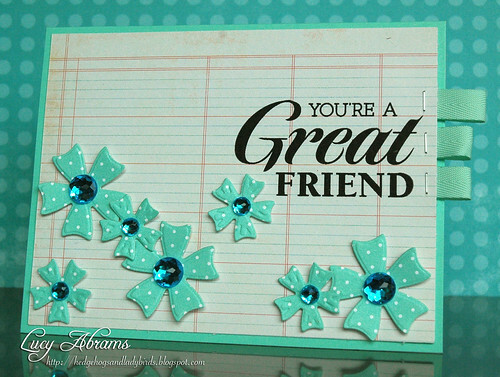 I like your ribbon treatment and the lovely flowers with the sparkly centers. Gorgeous fresh colour, Lucy! Love those pretty flowers! Oooooooohhh yummy card! Love the stapled ribbon tags on the side! I've always wanted to try something like that, but then forget LOL. The flowers are gorgeous and the colors are spectacular! sitting here... a card and some answers! Beautiful Brads... and a winner.